Apply Now For An Instant decision With No Obligation & No Fees. • You are employed or have proof of regular income. You can’t be guaranteed a UK payday loan if you don’t meet the basic criteria above. Guaranteed payday loans are a myth. What you should be concerned with is the loan approval rate of your preferred lender. What is a loan approval rate? A lender such as SwiftMoney with a 97% loan approval rate offers you a 97% chance of getting your loan application approved if you meet all the requirements. Out of 1000 correctly-filled applications, only 3% get declined, and this may be because of small errors such as; spelling mistakes in loan application forms, omissions, etc. The importance of filling your loan application correctly can’t, therefore, be ignored. Why is SwiftMoney able to approve 97% of applications? One, we have a seamless online application process that reduces the number of loan application errors significantly. Manual loan applications have a lot of room for errors. Our payday loan application process is fully automated. It is also simple, clear and straightforward. We also have hundreds of lending partners ready to consider your loan application. Once SwiftMoney loan applications are completed, they are shown to our vast panel of lending partners. This increases the probability of your loan request getting matched with a willing lender. 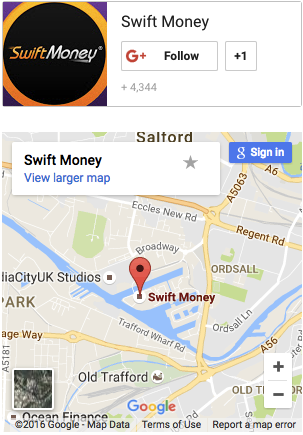 SwiftMoney operates a credit brokerage (FCA-authorisation number: 738569). We don’t charge borrowers any fees for using our service. However, we receive a small commission (from our lending partners) that is based on successful introductions. It is therefore in our best interest that your loan application gets approved. Do we offer guaranteed payday loans? No. However, our payday loans are almost guaranteed considering we have a 97% approval rate (higher than the industry average). How do you increase your chances of getting a payday loan? As mentioned above, guaranteed payday loans don’t exist. However, you can take some measures to increase your probability of getting an emergency loan, cash loan, instant loan, etc. when you apply for one. Your chances of getting a UK payday loan are almost guaranteed if you meet the basic eligibility requirements. There are countless payday lenders in the UK waiting to lend anyone who meets the requirements. Provided you are a UK resident, 18 years old or more and you are employed or have a steady income, you can get a payday loan easily. Although meeting the eligibility requirements automatically raises your chances of qualifying for short-term loans, you must submit correct/verifiable information in your loan application form. For instance, you must submit your real name, DOB, address, phone number, employment/income details, ID, etc. The information submitted must be correct/accurate (no spelling mistakes or omissions) otherwise the application will be declined. In case of typos or omissions, your application may be returned to you for amendments lengthening the process of getting a loan. Considering payday loans are taken in emergency cash situations (you don’t want any unnecessary delays whatsoever), the importance of submitting correct information can’t be stressed enough. SwiftMoney offers no credit payday loans. We don’t use credit scores to determine whether we will approve or decline loan applications. However, a good credit score goes along way with our lending partners. Please note that having your loan application approved doesn’t mean that our lending partners are obligated to give you a loan. SwiftMoney isn’t a direct payday loan lender but a credit broker. Successful loan applications are shown to our extensive network of lending partners who provide the loan amounts against applications. Unless you have the “worst” credit score, your chances of being among the 97% who get loans are very high. Even if you have a bad credit score currently, working on it consistently will ensure you get short term loans easily in the future. You can boost your credit score by taking on new loans and paying them on time. You can also review your credit report to uncover errors (if any) and dispute them. Responsible lenders carry out affordability checks which are simply; checks carried out to access if a borrower can repay the requested loan amount comfortably. Affordability checks are conducted using information submitted in a loan application. Once you give proof of income or employment information as well as information about your expenses like current loans, living expenses like utility bills, rent and food bills, a responsible lender uses this information to assess if you can afford the loan you have applied. Your chances of getting a payday loan are low if you are attempting to borrow more money than you can afford to repay comfortably. Ideally, your monthly loan repayment shouldn’t take up more than 30% of your net income (money you are left with after tax and deductions like mortgage repayment, before paying for basic expenses). Are you looking for “guaranteed payday loans”? If yes, you should consider borrowing what you need preferably, small amounts. Lenders tend to approve smaller loans more than larger ones because they carry lower risk. The probability of failing to repay a “large” loan is higher. If you are attempting to borrow £ 8,000 and another borrower (with the same profile as yourself) is attempting to borrow £1,000, preference will be given to the borrower with less risk although both of you may eventually get the loans you want. This shouldn’t be mistaken to mean that you shouldn’t borrow the loan amount you want. It simply means; lenders consider lending risk and smaller loans tend to attract lower risk (in most cases, not always). Furthermore, you should never borrow more than what you need. Guaranteed payday loans don’t exist. However, SwiftMoney offers the closest version of guaranteed payday loans in the UK. A 97% loan approval rate means your loan application is almost guaranteed but you must; meet all eligibility requirements, submit correct/accurate information, meet affordability checks, borrow what you need and keep working on your credit score.